Set within walking distance of Burnham railway station and with excellent access to the motorway network via the M4 and M40, this functional office accommodation is available on an all-inclusive basis. Burnham Village provides historic interest, yet is close to both Maidenhead and the business hub of Slough. Excellent rail and road connections mean that London and Heathrow are never too far away. 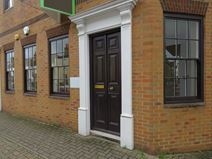 Situated in Burnham and providing good access to both Maidenhead and Slough this three-storey office facility provides furnished suites that can accommodate up to 20 people. Also available is an 8 - 10 person meeting room. Offering 24-hour access, this recently refurbished business centre provides quality modern office space, accommodating teams of up to three people. A few minutes' drive away is the A4, offering access to the motorway network, and there are other transport links in the form of Burnham Railway Station, from which trains run directly into London Paddington and Reading. Restaurants and pubs are located nearby.